FLYING DAGGER sports a very modern and bold look, thanks to her sleek styling, metallic anthracite grey hull and light grey superstructure. Her interior is equally striking. White is the dominant colour internally and along with large windows and portholes throughout, this makes for a very bright interior. Uncluttered by details, it is an open interior with restrained splashes of colour and many different materials and textures used to create a very contemporary, light feel. Her performance matches her looks and she is able to reach 34 knots thanks to triple 2400hp MTUs hooked up to Kamewa jets. Built by a highly regarded Italian shipyard, FLYING DAGGER is a very special yacht, one of just two 41S models built by Codecasa. United Yacht Sales New Jersey would love to guide you through a personal showing of this 134' Codecasa 41s 2009. 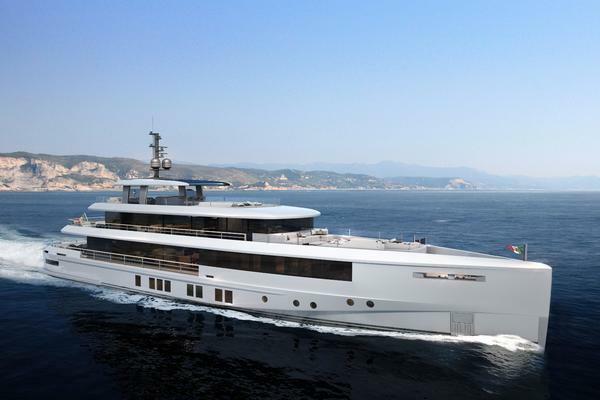 This yacht for sale is located in Livorno Italy and priced at $11,300,000. For a showing please contact us by filling out the form on this page and we will get back to you shortly! Guest accommodation (8 guests in 4 staterooms) From the spacious aft deck you enter the saloon which is far larger than one would imagine. The seating area is aft, whilst forward there is a comfortable dining area that will easily seat 12 guests. The immediate impression is of a clean and fresh interior flooded in daylight. The forward bulkhead which separates the dining area from the helm station is a work of art that can be illuminated in the evening. A staircase to starboard of the saloon leads down to the guest accommodation. Aft is the full beam Master stateroom, with a full width his and hers bathrooms whilst forward of the stateroom area is a large fully fitted walk in wardrobe in addition to ample storage within the main stateroom. Forward of the Master are two mirror imaged twin staterooms, with ensuite facilities. The VIP double bedded suite is located forward and is full width allowing for a large bathroom as well as ample wardrobe space. Crew Accommodation (7 crew in 4 cabins) The separate crew accommodation is located forwarded and is accessed from the bridge companionway, down to the enclosed commercial galley and then on down to the crew mess and the three bunk bedded cabins and the single Captain’s cabin.